This isn't really in Toronto but Mississauga if some of you are looking for a place to shoot a little west. There are some really nice creeks around the streetsville area. There is one that runs between Rivergrove St. and Bristol Rd. right behind the Streetsville downtown area. PM me for exact location if interested. And Mississauga Rd. of course. Specially the part that runs south of Eglinton and past the UTM. Really nice foliage in fall. My visit to the McMichael Canadian Collection in Kleinberg just reinforced my opinion that it's a great place, for photography or otherwise. The grounds and the first seven galleries permit photography, but not flash use. It's not too far out of the city, up Islington or Hwy 27.
oops..What about the Areospace Museum? Last edited by paolo.demarchi on Mon Mar 10, 2008 4:51 pm, edited 2 times in total. Allan Gardens was already mentioned. College street northside and west of Clinton , there's a very intersting area of alleys and streets. Queen West between Trinity Belwoods and Spadina. Scarborough Rosetta Park - Birchmount and Kingston Rd. -- but tripods alert security much faster than none -- so go hand-held for shooting. I've done a number of nice shots inside union with a bean bag. Ajax Frenchman's Bay the east side down Liverpool, or the west side down West Shore Blvd. Meadowvale Glen Rouge Park off Twyn Rivers drive and off Meadowvale directly east of the Zoo. Pickering "Nuclear" park with the massive $2 million windmill. 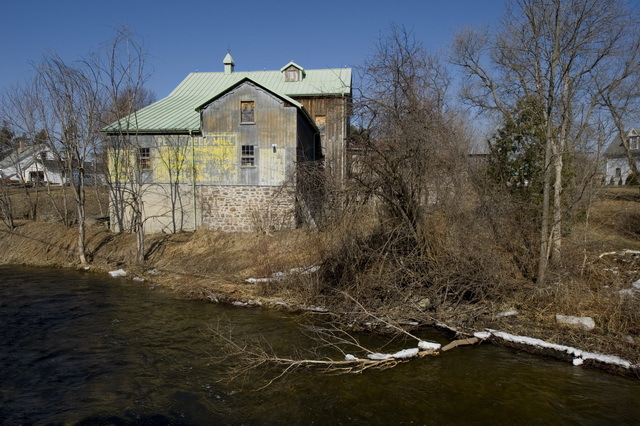 Mississauga - Credit river - multiple access points south of Eglinton and past the UTM. Really nice foliage in fall. Thanks for the link!! Looks like a place to go on a nice overcast day! I go through Udora all the time and had no idea there was a mill . No way! How could you miss it? Its right there at the river. I have an off the wall question... if you're shooting for non-commercial work .. do you need a permit? If it's a on location set up? Depends if it's private or public property? It really depends on where you're shooting. Different locations may have different rules and regulations. Some private places will charge you, even if it's for non-commercial. Also depends if you have lights set up or maybe in a group (with other photogs, or a MUA or assistant(s).. these are all factors that will affect permits, cost, etc. Last Wed my wife and I were shooting at the UofT along philosophers walk. I forget the name of the building but as you look in towards the inner courtyard there is a tall skinny abstract scupture just inside as you come back into the opening of the courtyard. We went in and started shooting. I was using a tripod and a woman came out to make sure I was not taking commercial photos and I was asked to sign a piece of paper saying that I was not doing photography for commercial purposes. It was all a very polite and cival exchange. It's been mentioned a handful of times already but I thought I'd add this link for Hamilton's Waterfalls. In the vein of this topic are there any suggestions for shooting indoors in the downtown core? I'll be in the city Frida and it's to be be pretty freakin' cold... The purpose of the shoot is to get used to using a Tokina 11-16 before a trip next month. Suggestions? Can you tell me is it safe to shoot at Don Valley Brickworks alone? I plan to go on Sunday. You aren't going to get into the Brickworks itself since it's now patrolled by Security and under construction. Very not safe to try. Thanks Rob - do you know if it is mono pod-friendly? just thought id share a tip. Whenever i find an interesting place to shoot i grab my phone and take a shot with a geotag. that way i can review them later. If we all did that we could all share some interesting spots with a preview of the potential area. Hello All.. quick question about the Guildwood Park in Scarborough. Somebody mentioned that during weekends there are lots of weddings going on. Someone else suggested that if we visit early enough it should be fine. My question is: how early should it be? You can shoot any day but if you have a model then Saturday is their busiest paying day because of weddings and if you look just a bit like a pro (what ever they look like they may ask for a permit. Unless it' looks like a commercial shoot any other day is usually fine. If they do give you grief then just move to the lake shore. I have done a model shoot at the location but I had permission from the city. If I go there on Saturday and there's a wedding, will I still be able to shoot anything interesting in there? I mean what's the situation when there's a wedding? are they gonna occupy most of the spaces? Hi everybody...this is such a cool topic, I'm new over here, forum and country too, and this is where I can get so much info about places to go and photograph. Are there gonna be any meetups or photowalks anytime soon?